Our Cub Scouts are getting ready to celebrate another anniversary of Cub Scouting, but with a little twist. The year is not 2006 but 2106!! Our boys will have fun using their imaginations and looking into the future. What will a Blue and Gold Banquet be like 100 years from now? What kind of food will be served? Will our Cub Scout uniform be a one piece jumpsuit like the astronauts wear? How will our future be different from the world we now live in? Let’s see if we can find out. Personal Achievement, Boys will be aware that the goals they meet today will make a difference in the future. Good Citizenship, Boys will learn that many things will change in the future, however, we still have a responsibility to our community. Fun and Adventure, Boys will have a chance to explore futuristic ideas. Courage, Boys will learn that even though the future will be different from today, everyone still has to do the right thing. 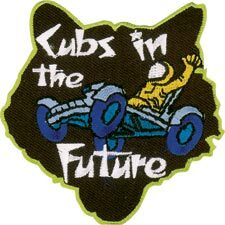 Let’s see, what is this month’s theme – Oh, yes, “Cubs in the Future.” In our future are many changes and they will be coming faster and faster. New computers, new games, new vehicles (Have you seen the ads for the hybrids that are coming out now? ), new efforts to save the environment, historical buildings and places, better knowledge of how to treat and care for the wonderful human bodies God has given us. But when I went through most of the Pow Wow Books, the only future thing I found was SPACE. I tried to spread out what was in Baloo to give you some other future stuff, too, but resources were limited. Space was probably the whole future when I was a boy watching the progress toward the first Moon landing from Shepard to Grissom to Glenn, from Mercury to Gemini to Apollo (Remember the Christmas Eve flight of Apollo 8 and Bible reading from Space on this man’s first flight around the moon?) But now days, Space travel is accepted and our Cubs are looking forward to many other things in their future. Make use of their imagination, please. When I saw Julie prepared this month’s material, I started with the SGV-LBA-VH Pow Wow CD. This turned out to be a great choice!! That book had a nice distribution between space and other future items. Be sure to check out the Cubnac skit they (and SHAC) had!! Now this is the Blue and Gold Banquet theme, so keep it fun. Celebrate that birthday party in a future style – design new uniforms (there are hints in Baloo), have aliens visit, create new occupations, have computers and robots doing exciting things! Q: Do you know how many Lutherans it takes to change a light bulb? A: CHANGE?? Did you say CHANGE?? I received many, many Pow Wow Books this month. Thank you all. I now have Sam Houston Area , Heart of America, Greater Saint Louis, Great Salt Lake, (These last two caused me a problem when I was copying stuff onto my machine – they have the same initials – GSL), Baylakes, Alapaha (Valdosta, GA), Baltimore and Northern NJ. Santa Clara County council and the Verdugo Hills, Long Beach Area, San Gabriel Valley Pow Wows are yet to happen! This should be a really great year on Baloo. If I missed thanking someone, sorry. I will begin mailing CD swaps out after my RT on January 11, 2005.